CD' Aldehyde-Induced DNA Damage ELISA Kit (Ethenocytidine Quantitation) is a competitive enzyme immunoassay developed for rapid detection and quantitation of ethenocytidine in any DNA sample. 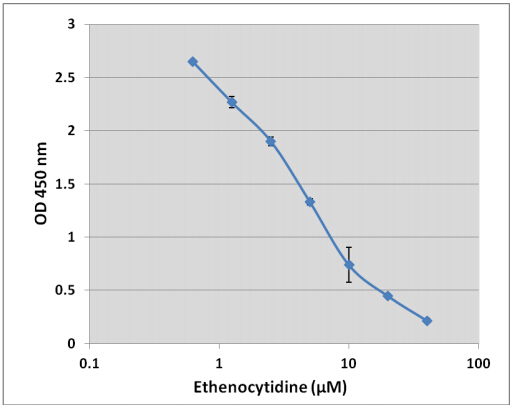 The quantity of ethenocytidine in an unknown sample is determined by comparing its absorbance respectively with that of a known Ethenocytidine standard curve. 1. 96-well Etheno DNA Coated Plate: One strip well 96-well plate. 2. Anti-Ethenocytidine Antibody: One 10 µL vial of anti-ethenocytidine. 3. Secondary Antibody, HRP Conjugate: One 50 µL vial. 4. Assay Diluent: One 50 mL bottle. 5. 10X Wash Buffer: One 100 mL bottle. 6. Substrate Solution: One 12 mL amber bottle. 7. Stop Solution: One 12 mL bottle. 8. Ethenocytidine Standard: One 100 µL vial of 4 mM Ethenocytidine in 1X TE Buffer. Upon receipt, store the Ethenocytidine Standard and Anti-Ethenocytidine Antibody at -20°C. Store all other components at 4°C until their expiration dates. Oxidation of phospholipids can lead to the formation of lipid hydroperoxides. These resulting shortlived hydroperoxides can either be converted to inert fatty acid alcohols, or can react with metals to form aldehydes such as malondialdehyde (MDA), 4-hydroxynonenal (HNE), acrolein, and crotonaldehyde. These aldehydes (which can also be formed through exposure to carcinogenic substances such as urethane or vinyl chloride) can damage DNA resulting in the formation of 4 major etheno adducts: 1,N6-ethenodeoxyadenosine, 3,N4-ethenodeoxycytidine, N2,3-ethenodeoxyguanosine, and 1,N2-ethenodeoxyguanosine. The presence of etheno bases mainly lead to base pair substitution mutations. The 1,N6-ethenodeoxyadenosine base can cause AT to TA or AT to CG transversions, as well as AT to GC transitions, while the 3,N4-ethenodeoxycytidine base can cause CG to TA transitions as well as CG to AT transversions. The level of etheno damage has been shown to increase during conditions of oxidative stress, such as in the presence of nitric oxide overproduction. Have you cited DEIA-Z0066 in a publication? Let us know and earn a reward for your research.